Greetings from our Highland studio, from where we welcome you to Chapter 2 of the Story Vignettes series of 'Watch & Wander through Paul Taggart�s Elphen Chronicles'. These videos are not our usual tutorials - they are something quite different and are filmed to share with you, the creative work that has gone into my illustrated story of ‘Webstrand, the Tooth Gatherer’. Whether you are a collector of artworks or illustrated books, a painter yourself, or simply someone who is intrigued by the process involved, we do hope you enjoy our various Elphen Chronicles series. It gives us the greatest pleasure to invite you to join us for a stroll around the collaborative work that is going into this unique project. Here you can watch me working at my drawing table and painting easel as I work on yet more of the many story-vignettes that are scattered throughout the entire story-book. 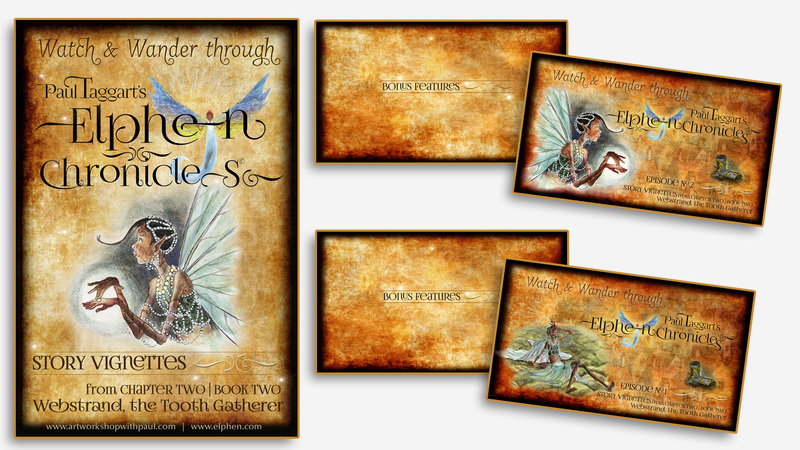 Please do check the Bonus Features for even more behind-the-scenes creativity such as Sunita’s handsome designs for the book and pages, as she places these vignettes within the text. These vignettes are quite different to my Masterworks oil paintings - one of which you can watch being created from the very first drawing-out stage, to the final finishing highlights in another series of Watch & Wander. This Masterwork is destined to be the Artist’s Legacy First Edition book jacket – https://vimeo.com/ondemand/elphenchronicles Watch out for the Bonus Features and Trailer in that series too, in which you get to see more of these large Masterworks oil paintings – each of which appears as a full-plate within the chapters of ‘Webstrand, the Tooth Gatherer’. Webstrand groaned, knocking her forehead with her hand. Webstrand’s voice had slowly risen in anxiety and Fizz was a little taken aback, by the thought of being eaten. Something, unfortunately, was niggling at the back of Fizz’s thoughts, suggesting to her that she would never, ever, get a chance like this again. BONUS FEATURE 1 : Chapter 2 – Watch & Wander through Paul Taggart’s Elphen Chronicles’ - https://vimeo.com/224174619 - In this behind-the-scenes peek into Artist & Author Paul Taggart’s studio, you catch him working in his sketchbook on the initial conceptual drawing for the above story-vignette in Chapter Two of ‘Webstrand, the Tooth Gatherer’. You get to drop in on his initial design meeting with Sunita Gahir and watch over Sunita’s shoulder as she subsequently works on her design updates. This is a collaborative project which we are pleased to share with you as it progresses. See the painting come to life on Paul’s easel in Episode 2 – https://vimeo.com/ondemand/elphenvignettes201/225720828 - which features one of a trilogy of vignettes in which Artist & Author Paul Taggart chronicles a series of incidents where Webstrand proceeds with her task, the purpose of her visit to Fizz’s bedroom. Webstrand raised her hands and began gently rubbing the back of her fingers. Fizz was intrigued and on looking more closely could see it wasn’t her fingers, but a large gem on a finger ring that she seemed to be polishing and at the same time, making strange gestures in the air. The gem set at the centre of the ring had a dark flaw, or fissure, running right through its centre. It reminded Fizz of Webstrand’s strange eyes. 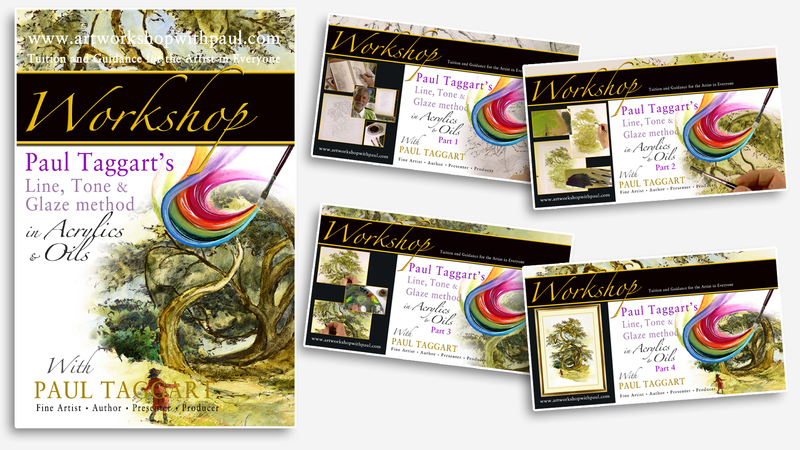 BONUS FEATURE 2 : Chapter 2 – Watch & Wander through Paul Taggart’s Elphen Chronicles’ - https://vimeo.com/226221345 - in this behind-the-scenes peek into Artist & Author Paul Taggart’s studio, you catch him working in his sketchbook on the initial conceptual drawing for another story-vignette in Chapter Two of ‘Webstrand, the Tooth Gatherer’. You get to drop in on his initial design meeting with Sunita Gahir and watch over Sunita’s shoulder as she subsequently works on her design updates. This is a collaborative project which we are pleased to share with you as it progresses. As always, this comes with best wishes from Eileen and myself, not to mention Webstrand and Starfire.